Show Us Your Amps Then! Discussion in 'Bass Amps & Cabinets' started by anarchyok, Mar 23, 2006. Here's my humble rig, note the cool blue led for the on led! would love to see some nice Tubepaths in all their glory, tubes glowing etc! My big dirty stack of magic! Damn! Don't say that dude. Shows em up a treat onstage though man. Very imposing. Which I like very much. Not a Warwick Amp, but what the heck...This baby moves enough air. this is a nice stack! 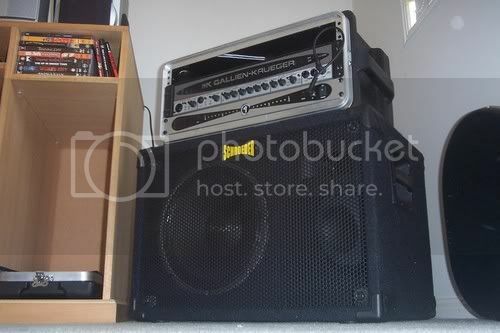 i´ve owned the same cabinet with a Peavey Mark IV head. That`s great!! It`s been with me for 8 years, bought the whole rig for just 300$. BTW, I`m not entirely sure of its capacity. It draws 800W, but on the back it says: 210W in 4 ohm, 300W in 2 ohm, 30V RMS. It`s got two speaker-outputs. 4 ohm impedance, and crossover at 500 Hz. Not Warwick, but sounds great nonetheless! Thanks mate! I just need to find something for that top rack space! I've been contemplating a DBX 160a! Yes, a nice compressor would be sweet! I'd love to hear the schroeder in action. I'm yet to actually hear one, but i've heard nothing but good things about them! They're certainly great cabs, no chest thumping lows but a big bottom nonetheless, and a really nice low-midrange. Can't wait to hear my newcoming Warwick growl through this setup! Oh and anarchy, let's see some pics of that new Nemesis rig! Its normally teamed to a Hartke VX410 also. Still love my little BlueCab20, great little amp for low volume situations. Pic isn't great quality but you get the idea! Wow dude! That looks awesome. Love the blue NEMESIS light. Do yourself a favour and ditch that HArtke and get another Nemesis 4x10 or 2x10! 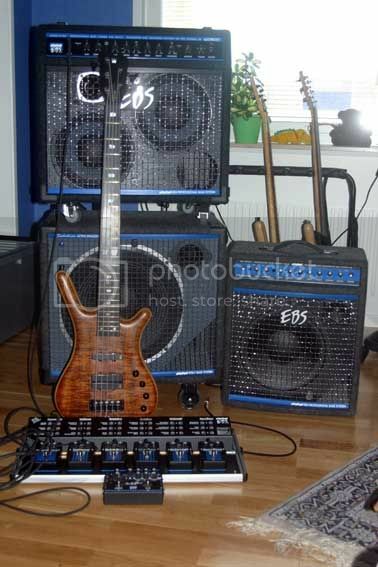 That would be a killer rig. Hmm I'm gonna have to look into those BlueCabs, I've been looking for a nice sounding small combo.. How much did you pay for yours if you don't mind me asking? It looks like Warwick discontinued the Bluecab 20 and brought out a Bluecab 15 with an 8 inch speaker, that would be perfect for what I'm after. I'll have to find out a price. my BlueCab20 cost me $230 Australian....not bad at all! Wow that's cheap. I wonder if the newer Bluecab 15 would cost around the same. Show Us Your Guitars Then!